If you’ve ever asked yourself, “How much is that cute puppy in the airport security line?” you’re in luck. Well, sort of. The Transportation Security Administration (TSA) is always training new service dogs to take on the important tasks of sniffing for explosives at U.S. airports. But like all service dog training programs, not all dogs make the cut. Some may be deemed too uninterested in the task at hand, too stressed by the high-intensity lifestyle, or yes, even too nice. And when that’s the case, the dogs are put up for adoption through the TSA Canine Adoption Program. The program also adopts out dogs who have been retired from their government service. Dogs who have failed TSA training can still make fantastic pets. In fact, some of the reasons dogs fail the training—they’re too people-friendly, for example—are the very things that make them excellent animal companions. To get selected for TSA Canine Training Center in the first place, dogs must present with a few important qualities, including high energy and drive. And while they’ll generally receive some training in explosives detection—that’s it. No basic training, and most of the dogs aren’t house broken. That doesn’t mean they can’t be trained into wonderful animals, but you’ll have to be ready to put in a little bit of work first. Any dog adopted through the program is still going to require plenty of obedience training and exercise, as well as help learning basic skills. Most of the dogs have not been around small children or any animals other than fellow large-breed dogs, so you’ll want to keep that in mind, too, when deciding if the TSA Canine Adoption Program is a good choice for you. All of the TSA’s dogs are vaccinated, and they are spayed or neutered before being placed up for adoption, if they haven’t been already. Most of the adoptable dogs are failed trainees and on the younger side—about two to four years old. Retired TSA service dogs are older, but they are less commonly put up for adoption through the program. As for breeds, no Pekingese or Chihuahuas here. The TSA only works with large breed dogs, most commonly Labrador Retrievers and German Shorthaired Pointers. They also work with German Shepherds and Belgian Malinois, but those dogs are usually transferred to law enforcement agencies if they’re no longer a good fit for the TSA. You can request a specific breed when you make an inquiry through the program, but breed-specific adoption requests may take longer. If a failed airport service dog sounds like exactly what your family needs, you can apply to adopt one through the TSA. If you live in a condo in the city or have little kids running around, you will likely be unable to adopt through the program. Do keep in mind however that there are plenty of other organizations from which you can adopt failed or retired service animals, including Freedom Service Dogs of America, Mission K9, and Service Dogs Inc. If you do qualify for and get accepted to adopt a dog through the TSA Canine Adoption Program, you’ll have to travel to the dog and not the other way around. All adoptions are handled out of Joint Base San Antonio-Lackland in San Antonio, Texas. There are no same day adoptions, so you’ll need to allot multiple days for meeting the dogs and finding the right fit. Dogs cannot be returned to the training center once they’re adopted, so the TSA will work with you to ensure you find a dog who seems like they will do well in your home. 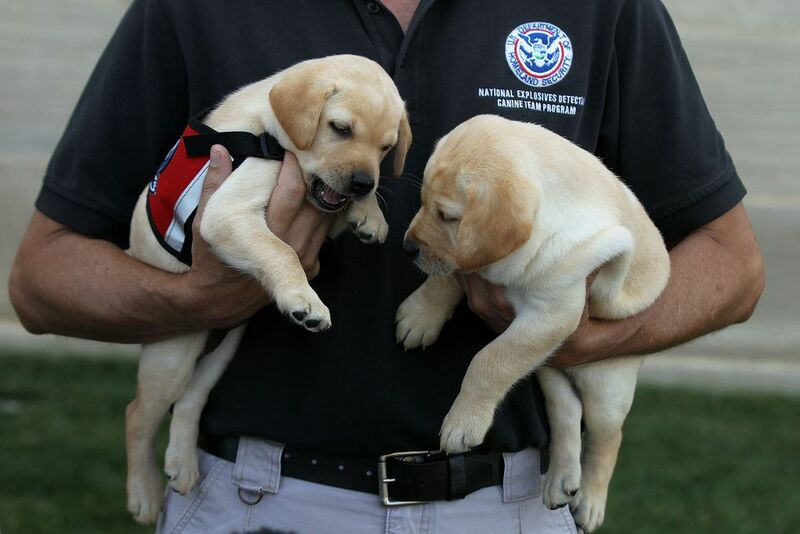 At any given time, the TSA has about 140 dogs and puppies being trained for explosives detection. About 83% of them graduate. Only seven breeds of canines are admitted to the program: German Shepherds, Labrador Retrievers, German Shorthaired Pointers, Wirehaired Pointers, Vizslas, Belgian Malinois, and Golden Retrievers. It is totally free to adopt a dog through the TSA Canine Adoption Program. However, keep in mind that you will likely need to spend money on training in addition to your standard dog-care costs. You will be required to sign an Indemnity Agreement upon adoption of a TSA dog. This agreement states that you accept all future risks and consequences of the dog, and that you agree to pay for all future care. Per the agreement, you must keep the animal as a pet and cannot sell it. Adopting a dog through the TSA dog adoption program is, in many ways, very similar to adopting a dog through a shelter, with the caveat that the dogs cannot be returned to the TSA’s care if things do not work out. Before you apply, make sure that you’re prepared for the level of care that will be required and that your family is ready for a large, highly-active animal. That includes a dedication to training, and the ability to work in plenty of walks and lots of playtime. Failed detection dogs can make stellar family pets. Learn more about the TSA Canine Adoption Program here and check the site regularly so you know when applications are being accepted.